exclusively here at Tacoma Nissan, WA. During my daily walks to the dealerships FIAT of Tacoma, Tacoma Dodge and Tacoma Nissan here in Tacoma, WA I was lucky enough to catch one of the National trainers of Nissan USA with their 2017 Nissan Pathfinder. And let me tell you, Nissan did a fantastic job to re-design this 3-rd row large SUV for the US-market. We are really eager here at Tacoma Nissan to serve our customers around the Puget Sound, Puyallup, Auburn and Burien and have soon this SUV here available to test-drive. As you will see in the video below, I have pointed out a few great things I loved and have changed. Things like motion sensor opening tailgate, huge space for the 3-rd row passengers to travel comfortably, panorama sunroof allowing back passengers to count the stars by night, and…well take a look at the video, and you’ll see what I am referring to. it is fantastic, and I love it. In case you missed the YouTube video on the 2017 Nissan Armada, you will be always able to see the quick introduction and short walk-around on this huge SUV here. For a short write up on the Armada, you also can visit the post on VJ Drives Tacoma. 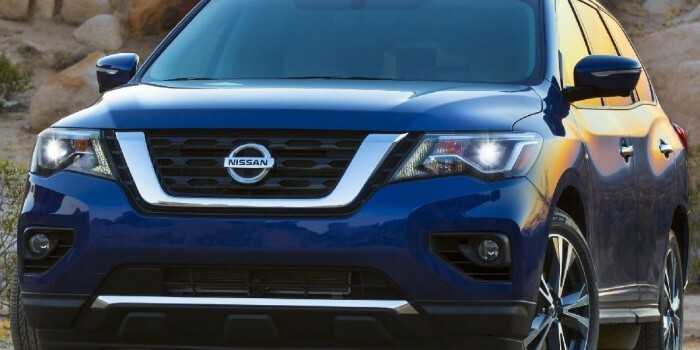 For any more information on the 2017 Nissan Pathfinder, please feel free to contact as on our website or give us a call at (253) 579-1200 or when you’d like to take a look at our current 2016 Nissan Pathfinder Specials just click on this link here -> 2016 Nissan Pathfinder. Thank you all for watching and reading. Until the next time…Your VJ from VJ Drives Tacoma.